tFrom the country’s glistening lochs to its history-soaked coastlines and sky-scraping mountains, Scotland is truly a rambler’s paradise. With so many natural beauty spots to explore, it can be difficult to know which of the many walking trails to follow. To help you on your way, Shoetique has created this useful guide to the very best walks in Scotland, so you can effortlessly plan your next walking holiday. Loch Ness has become something of a tourist destination, with people travelling far and wide to try and spot the legendary Nessie. For a more relaxing experience, follow the South Loch Ness Trail. The route is quite lengthy at 28 miles in total, so you may want to tackle it in sections depending on how long you’ll be in the area for. The elevated route begins at Loch Tarff and provides ramblers with exceptional views of Loch Ness as they make their way towards Torbreck. It’s not just the majestic scenery you’ll be able to take in during the route though. You’ll see everything from the remains of an Iron Age fort to the Thomas Telford pier. Towards the end of your ramble, you’ll pass through the village of Dores. Situated on the shores of the Loch, The Dores Inn is the perfect place to enjoy a refreshing drink and a home cooked meal as you look over the glass-like waters. Due to the steep inclines that feature along this route, it’s really important that you choose a pair of walking boots with a sturdy grip and padding around the ankles for extra support. You can find out more details about the route here. 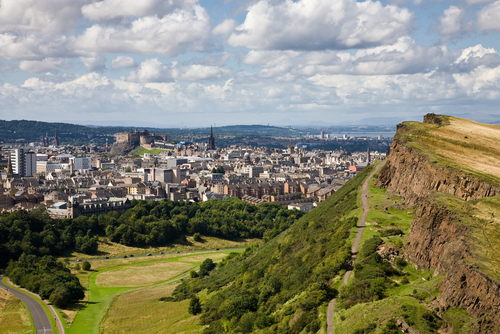 When most people think of Edinburgh, they think of a bustling Scottish city — and they’d be right! Yet many people are unaware of the hill walking opportunities the urban area has to offer. Arthur’s Seat is a dormant volcano in Holyrood Park. While the route may be rocky and rough, it makes a great trail for walkers who want to enjoy spectacular views across Edinburgh’s city centre at the top. If you’re not cut out for the terrain, you can still take in the picturesque park from ground level. Because of Holyrood Park’s close proximity to the city centre, walkers are spoilt for choice when it comes to refreshment breaks. A popular choice is The Sheep Heid Inn. Located on the edge of the park, the homely pub is the perfect place to warm up. Walking the route in the summer? Pack a picnic and dine alfresco in the park. Protecting the foot is key if you’re going to succeed on this route’s terrain. Opt for cushioned soles to protect against uneven rocks and stones, and a waterproof upper to tackle the occasionally boggy conditions. More information about the route can be found at WalkHighlands. To learn more about Holyrood Park, click here. 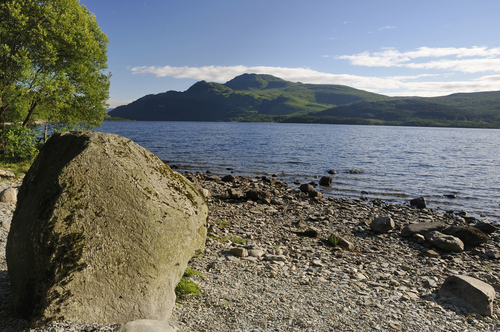 Standing at 3194ft above sea level, Ben Lomond is perhaps one of the most outstanding mountains in the Scottish Highlands, offering panoramic views over Loch Lomond and the surrounding areas. Starting in Rowardennan, the route takes walkers through wooded spaces over steep pathways towards the summit. From there, you can admire the amazing views as you slowly descend the trail. With a moderate to hard rating, the steep sections of this walk will put even experienced walkers to the test. The Rowardennan Hotel is located at the base of Ben Lomond, making it an ideal stop-off as you descend from the mountain. If the weather permits, take your tipple outside to the beer garden and truly soak up the views of the magnificent Loch Lomond and surrounding mountains. As Ben Lomond is a mountain, you’ll need professional equipment to ensure your safety. Cushion, support and stability are all factors you should look for when it comes to boots, while you’ll also need base layers and waterproof clothing for the trek. For more information about this route, visit Walking Britain. At 134 miles in total, The John Muir Way should be split across a few trips due to its sheer length. Running from Helensburgh to Dunbar, the route has been split into sections for those who do not have the seven to ten days required to walk the full way. While nature dazzles throughout the walk, it is particularly spectacular from North Berwick to Dunbar. 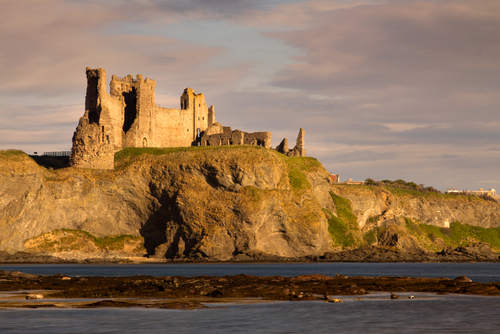 Over the 15-mile stretch, you’ll climb Berwick Law to enjoy spectacular views over East Lothian and the Forth, explore the picture-perfect surroundings of the John Muir Country Park and wonder at the imposing Tantallon Castle. You’ll find plenty of perfect picnic spots along the route as well as many pubs and eateries too. Once you’ve reached Dunbar Harbour, pay a visit to The Volunteer Arms for some freshly caught seafood. The length of the route means you’ll encounter a variety of terrains during your trip. Because of this, it’s best to choose a pair of all-purpose walking boots, with a thick tread, cushioned soles and support around the ankles. There’s plenty of other sections of the route that are worthy of a ramble. You can find out full details of the route on the official John Muir Way site. The Borders Abbeys Way is a circular route in the centre of the Scottish Borders. Comprising of 64.5 miles in total, the walk has been divided into five sections so you can tackle it piece by piece. With an easy to medium terrain throughout, it’s worth trying to tackle the full route at some point, especially the 12-mile stretch from Kelso to Jedburgh. During this section, you’ll take in the pretty sights as you work your way along the river bank. Look out for the many picture-perfect stone bridges and make sure you pack your camera to take a photo of the Abbey of Jedburgh ruins as your walk comes to a close. Treat yourself at the end of your walk at the Clock Tower Bistro and Bar, in Jedburgh. Offering a selection of wines, cocktails and fine foods, it’s the perfect place to indulge after a long ramble through Scotland’s outstanding scenery. From Kelso to Jedburgh, the terrain remains relatively flat. Select a pair of walking boots with cushioned soles to ensure you are comfortable throughout the duration of your route. You can learn more about the route by visiting The Borders Abbeys Way official site. Visit Shoetique today to discover an incredible selection of outdoor footwear for your next adventure.